House Minority Leader Nancy Pelosi (D., Calif.) said Friday she is praying for "divine intervention" to stop Brett Kavanaugh from reaching the Supreme Court. Pelosi spent much of her press briefing addressing the controversy surrounding the explosive Senate Judiciary Commitee hearing where Kavanaugh and Christine Blasey Ford, who has accused him of sexual assault, testified on Thursday. Asked by a reporter what she thought Rep. Jerrold Nadler (D., N.Y.) should do about Kavanaugh if Democrats won the House and he took over the Judiciary Committee, Pelosi said she hoped the point would be moot. "I'm hoping that Judge Kavanaugh will not be a justice on the Supreme Court," she said. "Let's just take it one day at a time." "I'm ever hopeful of an intervention, prayerful of a divine intervention," she added, when asked if Nadler should hold hearings on the matter. Pelosi went on to say that everyone should read Mark Judge's God and Man at Georgetown Prep, which recounts his days and alcohol abuse at the Catholic prep school he attended alongside Kavanaugh. Christine Blasey Ford has testified Judge was in the room when Kavanaugh drunkenly assaulted her at a high school party in the early 1980s; both men have strongly denied the allegation. 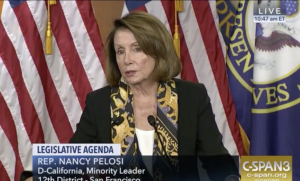 Pelosi said the book shows the "kind of activities that were engaged in as the judge was trying to present himself as a beer-drinking altar boy." She said she'd read the book "recently." Kavanaugh angrily defended himself at Thursday's hearing, acknowledging he drank alcohol but claiming he never blacked out or ever sexually assaulted anyone. Ford testified she was "100 percent" certain Kavanaugh was who attacked her.